Revelation's note to look at post 110 for the windows caused me to relook at the assembly picture on Post 101.. what is puzzling is the missing crown skin on at least one and maybe two fuselage sections (42 and 43). I think the red pieces in the background are stability rods .. Never seen Boeing join a section missing the crown skin. it's just too wobbly..
Might be a prototype issue. The crown skin is an important load path in aircraft with long fuselages. 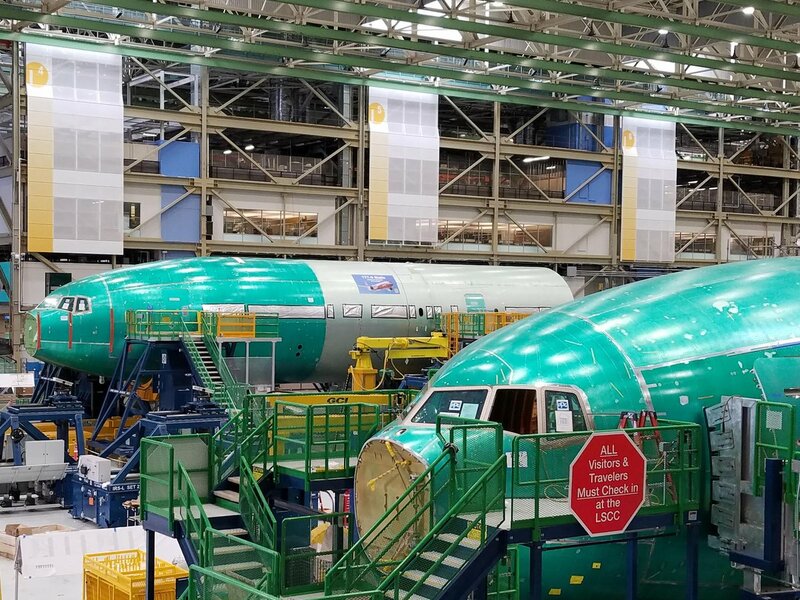 After all this is where Boeing knocks the sharp corners off the assembly process and sees what will work and what won't. It might be as simple as waiting for a revised design to arrive on the factory floor. Never seen Boeing join a section missing the crown skin. it's just too wobbly..
new idea on how to install the big cabin monuments? The section isn't joined, I don't think, but still being sub-assembled on the FAUB line. That transition you see in the right side of the photo isn't to the next fuselage section (mid-body), but to a separate panel in the same section. What is that white fuselage with a Japanese prefix? Former JAL 777-300 that was scrapped in June of 2015. 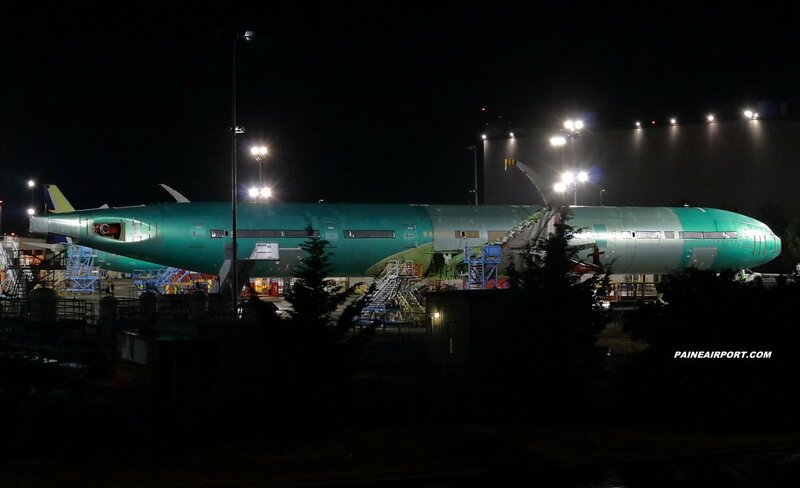 So it's likely being examined by Boeing to review how it's held up in service (it was delivered in July 1998). It might also have been used to help calibrate the robots. Yep. The scrapped airplane was discussed here before, and pieces of it have been seen sitting outside of the FAUB in Everett. I just looked for the video of the scrapping process again to share, and ended up finding a couple videos. It looks like JA8941 and JA8942 were both used. Here's JA8941, line number 152. Note that they took it apart into smaller pieces than seen in the FAUB video. 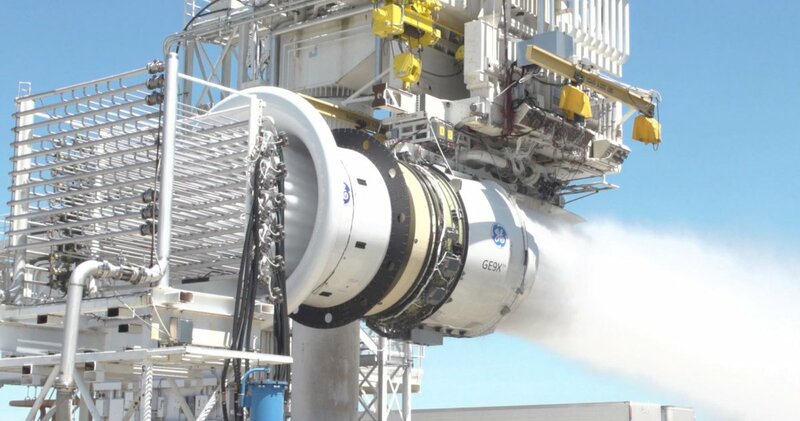 Just from knowing that Boeing learned some tough lessons about technical and schedule risks of ambitious new manufacturing processes after the 787, we can make some guesses about what it was for. Practice makes perfect. like the fuselage panel shown above? carbon-fibre covered ( didn`t they buy an autoclave for the wings? ) surely they`d do that in Seattle too? I don't think so, but maybe the frequent Antonov visits? They could move some parts by Antonov or Dreamlifter if needed to prevent schedule slides, but normally, large parts from Japan come by ship - I think unloaded in Seattle or the Everett main cargo terminal, then moved by barge to the Mount Baker Satellite Terminal in Everett. To fill Tedd in on a few details - the wings are carbon fiber and all the large wing parts are made in Everett. The fuselage is aluminum, and most of its parts come from the same suppliers that make them for the legacy 777. Really? I thought the fuselage was all carbon fibre as well? Only on the 787 so far. The fuselage tube is still aluminium. It is being built using a newer improved alloy that contains lithium. Aluminium lithium alloy is slightly stronger so quite a few parts will end up a few percentage points lighter. Alumnium lithium closes the gap between the current aluminium and carbon fibre when it comes to strength to weight. So even though the 777-9 is 3m longer the tube part itself will probably weigh the same as the 777-300ER. The 777X wing is significantly larger with a heavy folding mechanism. But as the wing is made out of carbon fibre the weight increase will probably be fairly minor. 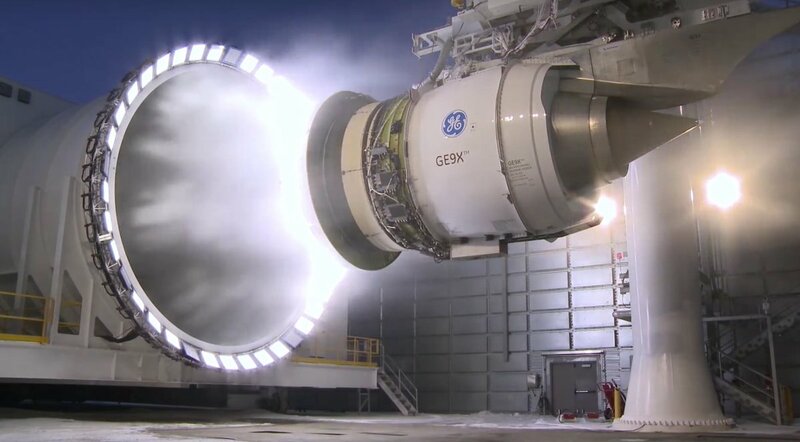 Same deal with the engines, significantly larger diameter but as it is made from newer materials it will reduce the weight increase. Even the shorter 777-8X is predicted to weigh more than the current 777-300ER. As the 777X maintains the current maximum takeoff weight the 777-9X when fully loaded will carry less fuel than the 777-300ER before hitting maximum takeoff. The reason the 777X will still be able to fly further is the larger wing provides a better lift to drag ratio meaning less thrust is required to keep it cruising. This combined with more fuel efficient engines should see 10-15% less fuel consumed per hour. So if the 777-9x takes off with 5% less it should still be able to fly 5-10% further. The banner on the far one appears to say "777-9 Static." One will be static and the other will be for flight. Can't wait to see it fly! Definitely worth the trip to PAE. Fortunate to be in this part of the country with how close I am to BFI/PAE/RNT. Yeah, okay CHS, oh well, can't have it all in the PNW lol. I am assuming that the new wing will have more flex than previous 777s, correct? Interesting note: first delivery is to NH in 2020..? "That aircraft will first fly in 2019, and Boeing plans to deliver its first 777-9 to launch customer All Nippon Airways in 2020." Or is this statement ambiguous? Where did Flight get a total of 263 orders from ? Boeing has been reporting 326. Is this just misreporting by Flight ? They must have arranged the numbers in the wrong way. In the article they say "Boeing holds firm orders for 263 777X aircraft, according to FlightGlobal's Fleets Analyzer database.". But according to FlightGlobal's Fleets Analyzer database it is 326 firm orders. The 777X has 263 orders when you forget to look at the -8 and unidentified orders. Whoa, and I thought the A346 looked like a flying phallus... dang that's a long plane! Are those the folding wingtips I see?! The static frame has the wingtips without the folding mechanism, as per the article posted few posts above. ok, so we've got the static test frame roll out..... soo......... when is the BIG roll out gonna happen? Probably pretty soon, right? Maybe the mechanism isn't there, but surely the component must be there to test the strength of the area? I think that is what people are referring to when they mention the folding tips on the static frame. 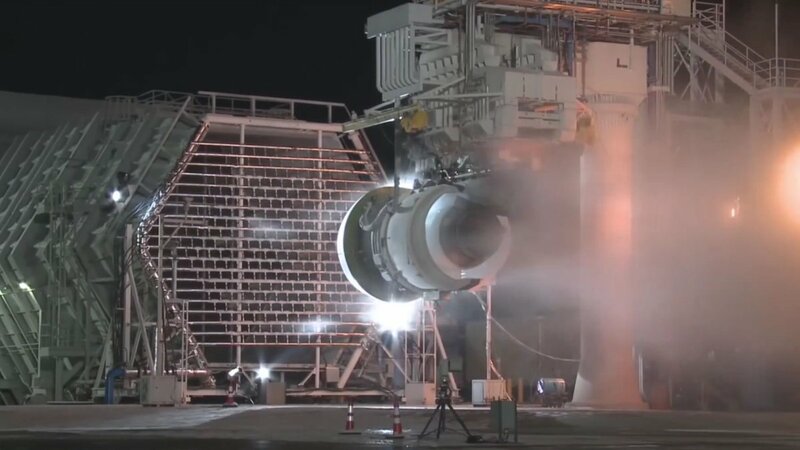 I just watched the video posted above and all they were trying to say is another test stand is used to test the wingtip mechanism, and the static test frame just has the load-bearing elements of the wingtip. This could mean it has the load-bearing hinges and locks but does not have the actuators and wiring, but I suppose it may have some of this too. This is the longest passenger airliner ever built. But unlike a fully-outfitted aircraft, the static test airframe lacks wiring & systems. It’s entirely structure. 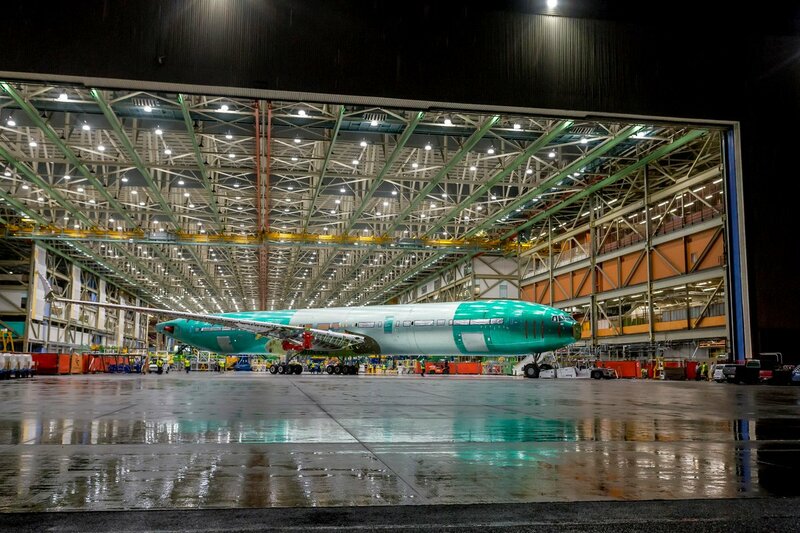 Its wings will be bent upward, its fuselage over-pressurized before the first 777X test aircraft is cleared to fly. and https://twitter.com/mattcawby/status/10 ... 1073645568 shows it leaving the factory with the wing tip up. Presumably they have a way to unlock the tip and hold it in the upright position. It has to have the wingtip hinge. 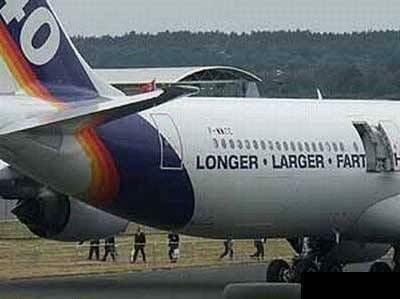 So I can only imagine long dong parked beside short and stubby at an airport in the near future, will be a sight to see, but I agree, that is a long long plane, hopefully not too long for the existing infrastructure. You probably just dubbed the aircraft. Fly the Long Dong to Many Inchon Airport. Fly the long straight route thrusting through the air in complete passion for flying! While the 777-9 is long, it's effectively the same length as the 747-8 and only a meter longer than the A340-600 (which I guess maybe we should call the "Dachshund" since it is long, but narrow). Just to be clear, the testing must go for a year so there is faith for passenger carrying. IIRC, the test airframe must always be at 2X the life of any passenger airframe (and inspected with resolutions for findings). In a year, that will take well past the first check. I’d shorten it to “The Donger”. Um... how are you shortening it, when what you said has both more letters and more syllables?? Not only that, but… why would one want to shorten the long dong? That is one hell of long aircraft!! All the best for the test team! Hope it's EIS is smooth with good dispatch reliability, not as problematic as what we have encountered in recent new aircraft. If that ever catches on you will have the Boeing PR people wring their hands to no end. As long as it's unofficial, I think they'd love it. The connotation is good and there is no bad PR. Besides, wasn't "LONGER" one of the A340-600's catch words painted on the demo airplane? I'm surprised by what look like a fifth set of exit doors. I thought Boeing had removed a pair from the original spec. Is this an optional feature or perhaps a glimpse into future model(s)?